Maybe It's not mental illness, it's mental brilliance. Thank you for exploring mental health with me! Visit Te-Erika.com to follow me to my next adventure! Feeling a little disheartened by my lack of progress so I decide to motivate myself. E47- Am I Open To Love? Seems like I have been blocking love from my life lately. Is there ever a good reason for that? I have a friend I have nothing in common with. Loving her is easy but conversation is not. All of this pushing for my goals is driving me crazy. Breaking down today. My reality may not be as great as my life in my head but that’s okay. I can’t get off this planet and it’s so lonely here. I have a standard for excellence which isn’t always a good thing. Accepting that every part of my life is normal for me, including mental illness. And it’s okay. My kids help me through my mental health issues. Everything turned out just fine. Excessive. Obsessive. Crazed. All adds up to one accomplished woman. After reading Michelle Obama’s memoir I am even angrier with my past. I stopped focusing on my mental health issues and I found my peace in an unlikely place. I am not suicidal but I have an interesting appreciation for death. 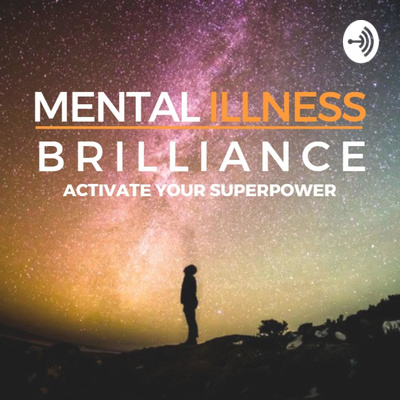 E35- Does Your Mental Illness Define You? You get to decide if your mental illness defines you? E34- Is My Mental Brilliance Standing in the Way of My Success? I’m wondering if my mental brilliance is standing in the way of my success. How can a mental disorder help you on your path to greatness? Listen to 5 mental illnesses every great leader needs. Going through a depressive episode at the moment. Trying to think of reasons to live. Michelle Dowell-Vest is a Clinical Hypnosis who says hypnosis is a viable treatment for mental health issues. It’s that time of month again. The time when depression hits but I won’t let it overwhelm me. I know the pattern. I am reading excerpts from an article by Jean Guerrero who shares the story of her father who was believed to be a paranoid schizophrenic. This article appeared on Wired.com in October 28, 2018. E28- Will Someone Love Me & My Mental Illness? Saw a great example of love for a woman who was mentally ill and it made me wonder if it could happen to me. I live in isolation. I am basically a recluse and that’s alright with me. In this interview with Justin Peck, author of Bulletproof, he explains how he manages his bi polar disorder. E25- What Is My Anxiety Telling Me? Today I realized that there is a pattern to my anxiety attacks. I can stop them but it will take some dedicated work. Are you feeling hopeless about the fact that someone has told you that you are mentally ill? What if they were wrong? My anxiety returned this morning. I went to the beach and was healed. E22- Why Would You Consider Suicide? I have considered suicide many times in my past. Here is why and what I do to move past it. Another anxiety attack forces me to recognize a pattern. Can I stop it? Harriett Tubman was a slave who escaped and became free. She is noted by historian to have mental health issues that led to seeing visions. Nikola Tesla was weird but no one can deny his brilliance. I am not normal and I decided that it's the best way to be. After a severe anxiety attack I head to the beach for self care and examine my limits in relationships. Currently in the midst of an anxiety attack with depressive thoughts. E15- Is it Mentally Healthy to Have A Work Personality? One of my weaknesses is fitting into work environments. My college friend said that I must change my personality at work in order to succeed. Singer Selena Gomez is in the news after reports of a mental breakdown leads to hospitalization. E13- Can I Live a Simple Life? I read an article that argued that it's difficult for smart people to be happy. Seems that those who live a simple life can. When you can't keep a job does it mean something is wrong with you Mentally? I talk to myself out loud. Do you want to listen? Interview- Robert is a freelance writer with severe anxiety and depression and he uses CBD oil to reduce his symptoms. Alyssa Patmos shares her history with OCD and how she is managing life and success. Interview- I chat with Dave about the model he created that eliminates collaboration issues with people who experience mental health issues. Learn more at 4sightmodel.com. Since reducing the number of depressive episodes in my life I have realized that Depression used to be comforting to me. Not anymore. I found these 10 Signs of Mental Illness and I think they are wrong. My anxiety attacks dont go away. I have found a remedy but it's not easy to find. E4- Is Lorna Byrne Retarded? Lorna Byrne claims she sees and speaks with angels every day. As a youth she was labeled retarded. Is she? How do I gain a sense of understanding about why people have hurt me in the past? Looking back, when did I first notice signs of mental illness? Explore with me. E1- So What if I Am Mentally Ill? I am a Mentally Ill Black Woman who also happens to be creatively brilliant. Get to know me.